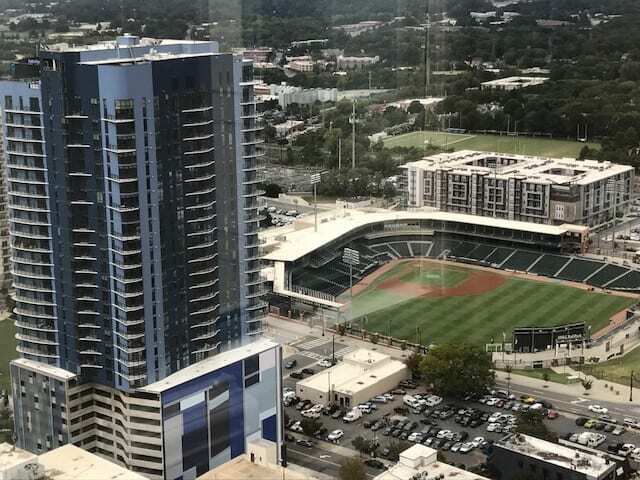 I had lunch in uptown Charlotte the other day — 32nd floor at the City Club. I don’t go downtown very often and truthfully, it feels like another world…a different culture: everybody walks fast, the men don’t wear neckties, and the women wear tight pants and snazzy shoes. But the restaurants are abundant and GOOD. Every few blocks they’re building another something tall. It’s like walking around the legs of a dinosaur. It’s hard to see the sky. The old Charlotte Observer building is gone…giving me a graveyard vibe. 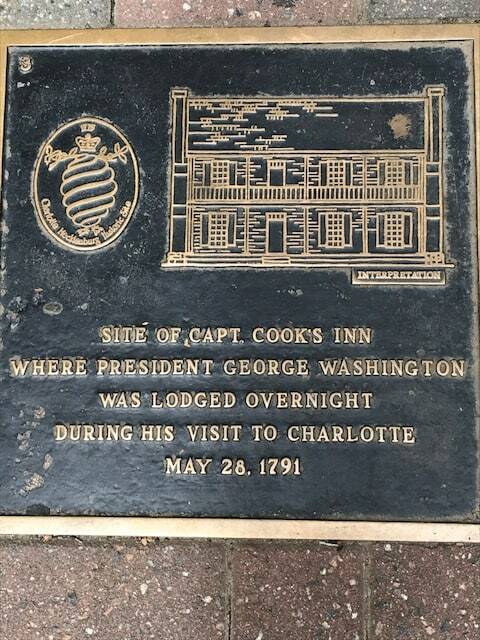 I felt like a tourist on the 32nd floor…’oh man, look at that and that.’ I took a few snapshots: the Knights Baseball Stadium, 51 floors of the Vue apartment building, the penthouses at the top rent for approximately $7,000 a MONTH, a brass plaque on the sidewalk on Trade St. reading “George Washington slept here.” I wonder if he brought Martha? And a shot on ‘The Green.’ The beautiful park on South Tryon with a clever directional sign. 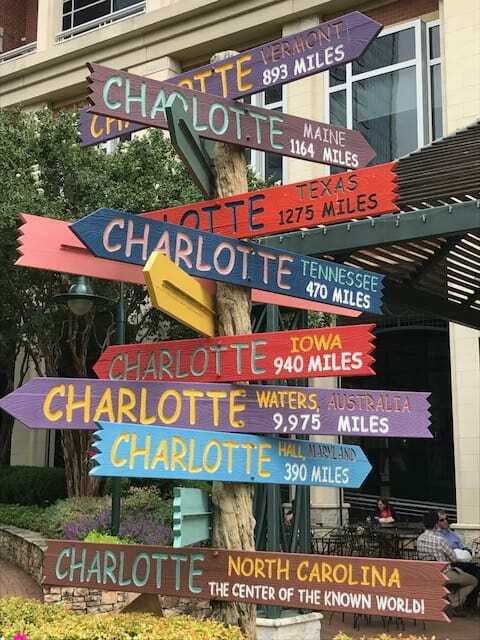 Here’s how I view Charlotte as a tourist in my own town. Knights stadium from 32 floors high! 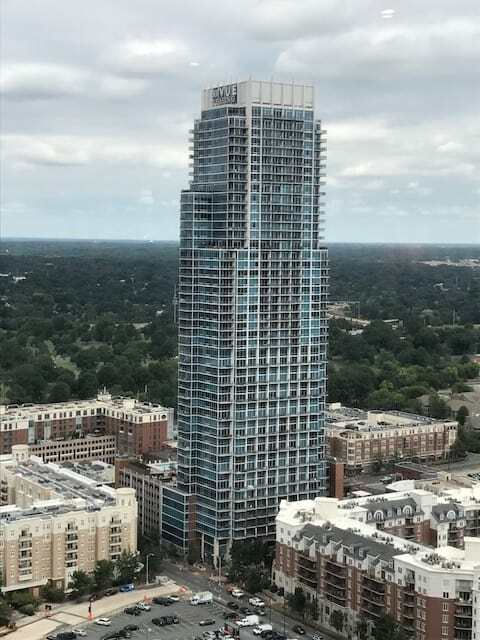 51 floors of Vue apartments. Standing smack in the center of the world! Hi, maybe it was a temporary glitch. Seems to be loading here… Thanks for the heads up.